Labral tears of the shoulder are very common. Tearing of the labrum can be found in shoulders of all age groups. That means that for some, labral tears are normal age-appropriate changes. Age appropriate tears can usually be ignored and do not cause pain. Some labral tears, however, occur from an injury. Many injury related tears will require surgery. You are here because someone likely told you that you have a labral tear, or a tear of the shoulder labrum and require surgery. How do we determine who might benefit from surgery and who should not consider surgery? Pitching or overhead sports is the most common cause of injury related labral tears. Many labral tears are due to the repetitive stress of overhead sports. Sports injuries due to a fall or collision which caused a shoulder dislocation can cause acute, traumatic tears. Most adults over 40 have labral tears on MRI. These are considered age appropriate in many people. That means that some labral tears occur because our parts simply wear out over time. In the young shoulder, the labrum plays an important role in keeping the shoulder joint stable and in a proper position. When a labral tear is causing a shoulder dislocation, surgery may be necessary. 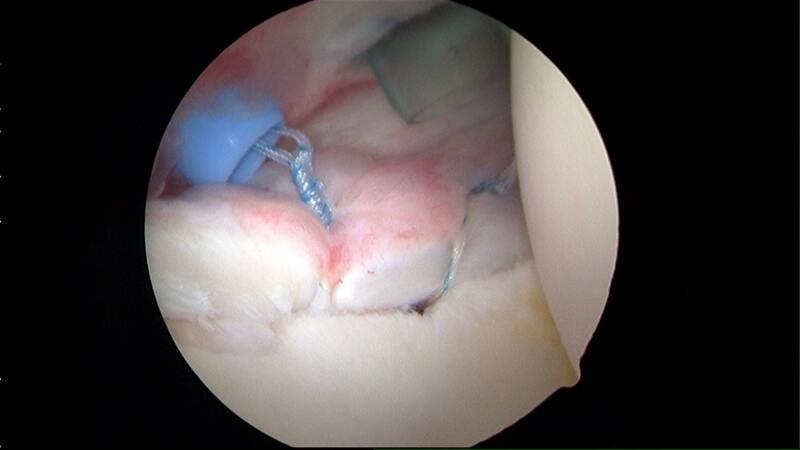 For our over 40 crowd, surgery is rarely needed for labral tears due to wear and tear. When determining what type of treatment we recommend for your labral tear we need to understand the reason why the labrum is torn. This could make all the difference in whether or not your labral tear requires surgery. See below for a video discussion, and below that for discussion about labral surgery techniques. In order to understand whether or not your labral tear might require surgery, we need a bit of background. What is the shoulder labrum? 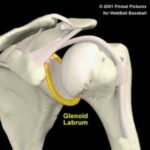 What is a labrum tear? Why did my labrum tear? 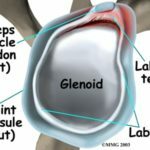 Do I need surgery for my labrum tear? The labrum (see images below) of the shoulder is a cartilage disc attached to the socket of the shoulder. The labrum functions by maintaining the stability of the shoulder. That means that the labrum helps the shoulder stays in its proper place. The ligaments which hold the shoulder bones together are also firmly attached to the labrum. Therefore, if I’m making myself clear, it should follow that if a labrum tear occurs, the ligaments of the shoulder may no longer be functioning properly. and whether or not we think the labrum tear is the cause of your pain. There are many different types of labral tears. Or perhaps a better way to think about it is that tears of the labrum can occur from different types of trauma. Different injury mechanisms include: repetitive stresses, falls, sports trauma, or aging and wear and tear. Many tears of the labrum occur because of injuries or trauma (a fall or sports injury). These tears were usually caused by a shoulder dislocation, click here to learn more about these labral tears. There are also tears of the shoulder labrum that occur because of repetitive overhead activities (baseball pitcher, volleyball player or swimmer). Perhaps the most common form of labral tears are those that occur simply because our labrum has worn out over time. A labral tear can be as subtle as mild fraying, or it can be severe where the labrum has been completely detached from the bone. If you fell down and your arm dislocated, then the ball of the shoulder actually pushed the labrum off of the socket. This is called a Bankart or Perthes lesion. 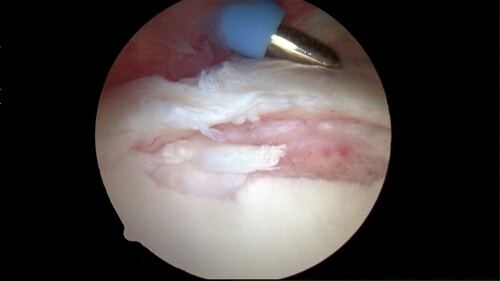 This is a common type of labral tear in athletes participating in contact sports. The athlete falls on the shoulder, the shoulder dislocates and pushes the labrum off of the socket. In overhead athletes such as pitchers or volleyball players, the source of the labral tear is usually chronic repetitive stress. That means every time you throw you are putting stress on the attachment of the labrum. Eventually, over time the labrum may separate from the bone (Peel Back Lesion). This is the most common cause of a labral tear in pitchers. 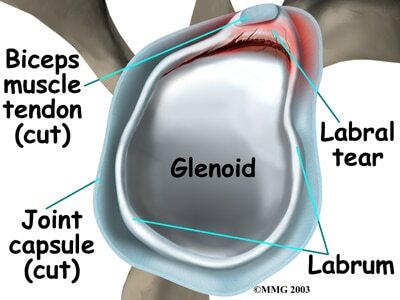 Now, in our most common group, and in most of us over the age of 40 the labrum simply wore out and is usually just frayed, in other words, the labrum is not actually detached from the socket. We consider these to be age appropriate changes. This is why we see labral tears in most adults shoulders. These are more often than not not the cause of your pain and do not need to be fixed. That means that your pain is due to something else inside your shoulder. The most common cause of shoulder pain in the adult is due to the rotator cuff. The following posts go into more detail about common causes of pain in the adult shoulder. Do All Labrum Tears Require Surgery? If you are an overhead athlete and have pain during throwing: Your pain persists, and an MRI reveals a labral tear. If you do not respond to physical therapy, there is a good chance that the surgery might be needed to repair the labrum. However, recent scientific literature has shown that you may not return to your prior level of pitching ability. If you have fallen and your shoulder dislocated, and now your shoulder continues to dislocate: then surgery to repair the labrum is well indicated to decrease the risk of future dislocations. Skip to the bottom of this article to read about labrum surgery and recovery from labral surgery. Labral tears are often seen on a shoulder MRI in people over 40. These are usually degenerative tears. Consider the case of a 44-year-old who has difficulty raising their arm, has pain at night, and has pain when trying to work out. In this situation, the labral tear found on the MRI is usually NOT the cause of shoulder pain. Once we are over 40, the most common cause of shoulder pain is rotator cuff tendinosis. and not a degenerative labral tear. A recent paper in 2017 showed that labral surgery in patients with an average age of 40 was no better than sham surgery. A sham surgery is where you are put under anesthesia, a few small incisions are made, but the labrum is not treated. The incisions are closed and the anesthesia is reversed. Not everything that is torn needs to be fixed. Physicians should endeavor to treat patients and not just their MRI findings. A recent article in the New York Times shows that nearly 90% of professional athletes had MRI findings consistent with tears or other problems in their shoulder, despite the fact that they had absolutely no pain. Therefore, it is of critical importance that the history or story that you give your physician about the pain that you’re experiencing matches the findings on your physical examination and your physician feels that your labral tear is the possible source of your pain. I will tell you quite clearly, in many, many people, the source of your shoulder pain is not your labral tear. Some labral tears produce “mechanical” symptoms. That can include catching, popping (not simple clicking), and pain during certain overhead activities such as pitching or volleyball. Those tears will often require surgery. Certain tears of the labrum can produce events such as a shoulder dislocation, or painful popping and snapping. Those are very clear signs and symptoms of a labral tear which is producing a problem in your shoulder and might require surgery to repair the labrum. Video: Do I need surgery for my labral tear in my shoulder? After the video, see below for more discussion about the recovery from shoulder surgery to repair a labral tear. Am I worried about my labral (labrum) tear surgery? There are many reasons why this is one of the most frequent questions that I field from e-mails through my website, or with patients whom I am interacting with my office. Virtually every patient is nervous about surgery. That’s normal. Perhaps the issue that you are worried about, and perhaps quite accurately, you worry whether or not the labrum is the source of your pain — and you worry if the surgery you are about to undergo is necessary. You also worry about the time off it needs to heal, and if you will be able to return to your prior level of activity. The surgery which is recommended today is an arthroscopic labral repair. During the shoulder surgery, a camera is placed in the shoulder, the labral tear and ligament tear is identified, moved back to its normal position and held in place with sutures. The recovery from labral tear surgery is long and quite annoying. Most of you who are undergoing a labral repair or labrum reconstruction is having the cartilage tissue sewn back against the bone. Although we put anchors into the bone and utilize them to reattach your labrum you need to wait until the labral tear actually heals back to the bone – which takes a minimum of 8 to 12 weeks – before you can start to put any significant stress on your shoulder. Surgery on the labrum generally involves a period of immobilization or the use of a sling. It may involve very light, gentle physical therapy if the surgeon finds that your shoulder might be getting stiff, however, you should not stress full range of motion of your shoulder, nor should you return to any overhead activities or weightlifting, until you have been given the go-ahead to do so by your surgeon. Many failures are the result of noncompliance (you not listening to your doctor :-) and not following the instructions of your surgeon, or therapy that has become too aggressive, too soon. Even when you do follow your physician’s instructions, and even if a repeat MRI shows that the labrum is healed, you may still have some residual symptoms (pain). 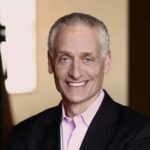 Many times, that’s because there was probably something else that was bothering you shoulder – – – or simply the fact that restoration of “normal” function – – – following a labral repair, is frequently not possible. Today we’re going to talk about labral tears. L- A-B-R-A-L. What is the labrum? The labrum is a cartilage disc and today we’re talking about the labrum in the shoulders. That cartilage disc provides a very important function; it helps maintain the stability of the shoulder joints. Many people will develop labral tears due to repetitive stress. Those are typically overhead athletes. Some people will develop labral pathology or tears because of overuse in the gym and working out. Some people will develop tears of the labrum because of a fall and the shoulder dislocates and you simply push the labrum off of the shoulder. The last group is the largest group who have labral tears; those are the people where the labrum has simply worn out. Now, if for some reason you go and have an MRI, there is a very strong likelihood that some form of labral pathology (tear) or the problem will be identified. Is that the source of your pain? Well, that’s for your surgeon to determine based on your complaints, your story, your history, and your physical examination. If you dislocate, and your shoulder keeps dislocating frequently, then the labral tear is the source of your issue. If you’re an overhead athlete and have pain in certain positions, then that labral tear may be an issue. We’re typically talking about the age group of around 15 to 35, beyond that, most of us have labral tears simply because the labrum has worn out — and the labral tear is probably not a source of your pain. More importantly now, if you should choose to have surgery, proper rehabilitation involves immobilization, not using that arm, letting the sutures which are holding the labrum in place do their job, so that labrum heals back in place. I see many people that started therapy or motion too soon, or they have not listened to their physician— all of which can lead to a recurrent or a new labrum tear. 1) Labral tears exist and are a problem in certain populations. The labrum is found to be torn in the vast majority of people over the age of 40. Those tears typically do not require treatment or certainly suturing at the time of an arthroscopy. Your pain sources are more than likely due to something else. 3) If you choose or require labral surgery, listen to your physician, follow the instructions. Do not be too aggressive otherwise, you may find yourself back in the operating room. Disclaimer: this information is for your education and should not be considered medical advice regarding diagnosis or treatment recommendations. Some links on this page may be affiliate links. Read the full disclaimer.